The first Sunday of November in Albuquerque means the Marigold Parade, a celebration of Dia de los Muertos. 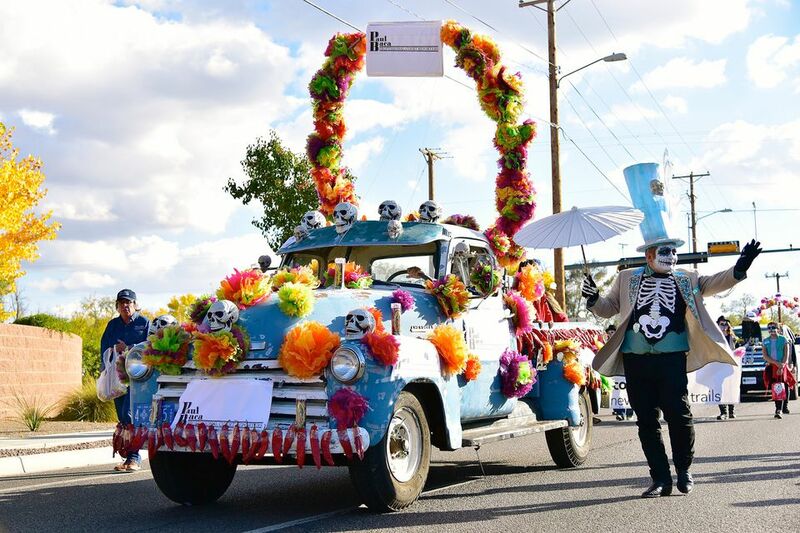 The Marigold Parade is well loved local tradition, famous for its Calavera art, music and sense of community. People from all points of Albuquerque come into the south valley for the day, dressed in costume and white face to remember the living and the dead. Dia de Los Muertos, or Day of the Dead, is an ancient tradition with roots in Mexico. It celebrates the life of those who have passed on and honors them with an altar, or ofrenda, which often contains photos of the loved one, along with their favorite possessions and other items that tell their story. The Marigold Parade has its roots in the art of Jose Guadalupe Posada, who portrayed people as skeletons or Calaveras. Everyone is the same when wearing the white faced skeleton mask, rich or poor, sick or healthy, young and old. The Posada Calavera was always laughing and seemed to be up to mischief, and that tradition continues in the Marigold Parade of today. Calavera faces are happy, not somber, and parade participants may not be up to mischief, but they are having a good time. The parade and celebration are free events. This year's date is November 5, 2017. Keep an eye on their website for details. Each year the highlight of the day's celebrations begin with the parade. Anyone can have a float, as long as it has the Dia de Los Muertos theme and has marigolds as decoration. Everyone on the float must wear Calavera. There are no Halloween costumes, no ghosts or ghouls, and no evil spirits, to include La Llorona. The parade is a family event. The parade begins at the Bernalillo County Sheriff's sub station, located at Centro Familiar and Isleta, and continues north on Isleta to the Westside Community Center, located at 1250 Isleta Boulevard. The parade begins at 2 p.m. In addition to floats decorated in marigolds and Calavera participants, low riders are a parade tradition and other cars from the area's car clubs. The parade is usually over by 3 p.m., but the celebration continues at the community center until 6 p.m.
After enjoying the parade, go to the Westside Community Center for food, music, art and a large display of altars. The Dia de los Muertos Arts and Crafts Fair has fine art, folk art, crafts, clothing and other items with Dia or Mexican/Chicano themes. All work is original; no mass produced items are allowed. Food vendors will have a variety of foods for when you get hungry. Music will get you dancing. Because everyone dresses in traditional Calavera, women in large hats and fancy old-fashioned gowns can be seen dancing along with men in suits and top hats. It's a festive congregation of happy skeletons enjoying life. The altars, or ofrendas, are set up inside the gym at the community center. A Dia de Los Muertos altar honors someone who has touched a life, from family member to community or historical leader. The altars acknowledge the positive impact a person had on someone's life. Altars traditionally contain photographs, mementos the deceased was fond of, a selection of the deceased's favorite foods, and a cup of water for them to "drink." A dish of salt is also on the altar, to season the food, and marigolds, chrysanthemums, and paper flowers as decoration. Altars also sometimes include sugar skulls, books, pictures of saints, and incense. Altars are as elaborate or as simple as their maker wants. They are a remembrance to honor someone who is now gone. Parking is wherever you can find it near the parade. Entry has to be from the south via Rio Bravo or west via Coors because Isleta is closed near the community center. The South Broadway Cultural Center has a Dia de Los Muertos celebration the same day. Our mission is to exert cultural self-determination, strengthen community, and promote cultural exchange through intergenerational learning and expression through art, music, food, dance and political satire. We want to promote pride in South Valley and cultural identity through our grassroots, non-corporate organizing.